If you are anything like the average recruiter, you probably spend six seconds or less when reviewing a resume for a potential employee. However, if your resume reading skills are rusty, or your company has started to recently hire, you may need a view pointers, not only on how to quickly read a resume, but also how to identify some potential red flags that could become a problem for your company down the line not only in time, but in money as well. Since you don’t want to miss out on a great candidate, reading resumes correctly is extremely important, but it can be time consuming. Keep these ideas in mind when reviewing your next stack of resumes. Have a plan. Before you start to go over resumes, take a minute to think about what the position you are hiring for needs, and have a clear focus in your head of what you are looking for. Start with the requirements of the position, and scan resumes for those skills. Read in chronological order. Most resumes begin with the most recent position held listed first. Read candidates’ job history back to front, and you will be able to get a clearer sense of their work history and experience, and will be able to notice any trends, whether good or bad. Look for similar accomplishments. This is similar to the first tip. Look for accomplishments that coincide with the position are you trying to fill. For example, if the candidate has won an award for outstanding computer skills and the position focuses heavily on computer aptitude, the candidate may be a very good fit. Screen in, not out. Keep in mind that you are trying to hire a person. Don’t go into resume reviewing with the attitude to dismiss any candidate right away, even if you are looking quickly at their resume. No one wants to hire a person who is only going to cause grief, time, and money later on. (For a more comprehensive view on the cost of a bad hire, check out this infographic on our blog). The following resume red flags can save your company in the long run. Changing jobs too often. This can point to a sign of flightiness or instability. Any resume that follows a trend of two years of less between jobs (without a good reason) should be avoided. Lack of bullet points/too many paragraphs. This can reveal one of two things: that the candidate does not have a sufficient amount of achievements or accomplishments to add, or that they have not taken the time to polish their resume, pointing to laziness. 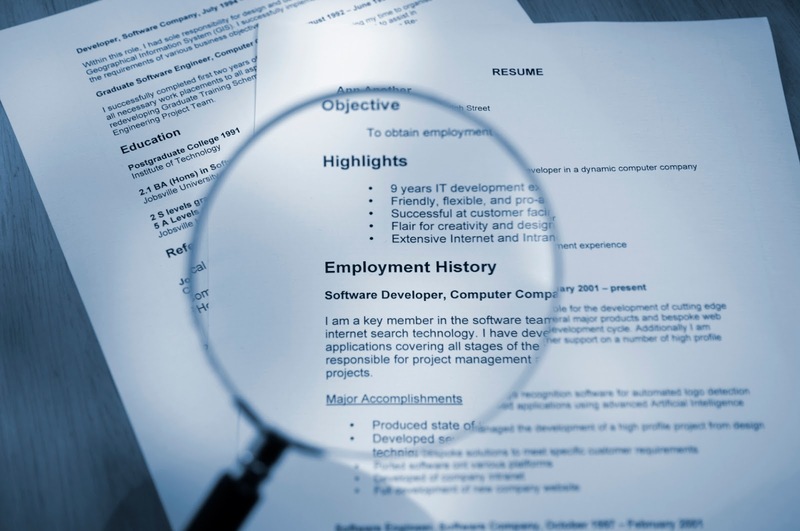 With all of the resume resources available, there is no excuse for a poorly designed resume. Lack of specificity. A resume that does not offer concrete examples of accomplishments but instead relies on generic or broad statements about work experiences should be avoided. Multiple layoffs. This reveals that the candidate is not exactly a stellar employee, as usually the least needed and mediocre employees are laid off. Reviewing resumes doesn’t have to be a long and arduous task. With the right attitude and a clear idea of both good and bad resumes, you can find an excellent candidate to fill even the hardest to place position.